Development Synergy: Happy International Women's Day! If You Are A Woman, The World Celebrates You! Happy International Women's Day! If You Are A Woman, The World Celebrates You! International Women's Day is a day set aside annually to celebrate women all around the world and their achievements. Different activities are organized globally to recognize women and celebrate their efforts, struggles and successes. This day also presents opportunities for more advocacies for the right of women, promote gender equality, etc. The theme for this year's International Women's Day is 'Inspiring Change'. What change are you inspiring out there to celebrate women and advocate for their rights? The world wants to hear about it. 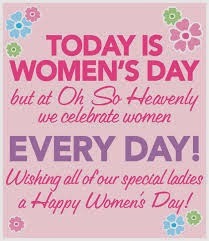 If you are a woman out there, the world celebrates you! We do hope you are celebrating yourself too :-). From all of us at Development Synergy, we wish you Happy International Women's Day!